I've never used this, so I can't help you fix it. But I find that the Phonetic Symbols section of the Character Viewer works well enough. Hi, I'm the author of IPA Palette. Snow Leopard "broke" some aspects of Input Methods (because it suddenly went all 64-bit crazy) so people like me (and those write screen saver plugins and such) suddenly had to scramble. 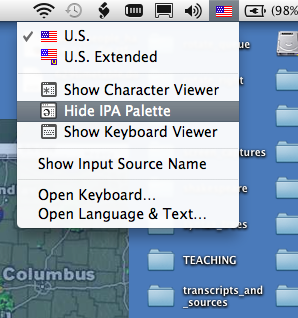 IPA Palette 2.0 addresses all these changes and works great on SL. Cheers, Moses Hall.